Did you know there was once five Beatles not four? The only time it ever happened was in Melbourne on the 14th June, 1964. The Beatles drummer Ringo Starr had collapsed and was hospitalized on June 3rd with tonsilitis prior to the tour beginning. 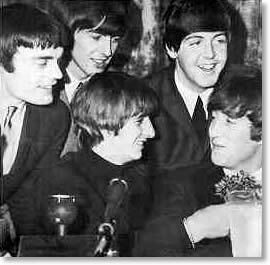 Jimmy Nicol was hired as a temporary drummer so that the 1964 Australasian Tour could continue as planned. After recovering, Ringo had flown into Melbourne with Brian Epstein and reunited with the group on June 14th. Jimmy Nicol departed for London the next day. On the previous day there were chaotic scenes outside the Southern Cross Hotel (on the corner of Bourke and Exhibition Streets) when the Beatles appeared on the balcony just above street level. Exhibition Street was blocked by an estimated 20,000 screaming fans. The Southern Cross then, is the ONLY hotel to play host to ALL FIVE Beatles! M.C: "The Beatles, John Lennon, Ringo Starr, Paul McCartney, George Harrison, and for the first time - Five Beatles - Jimmy Nicol who'll be leaving us tomorrow, who's done marvelous work during the temporary, brief, but very grave illness of Ringo Starr." → But there were 5 Beatles! → Footage of the Beatles touring Melbourne in the Princess.